As the clouds parted, all was revealed. On May 20th our Viaje al Sur (Journey South) officially changed directions to the north as we started the long journey towards home. 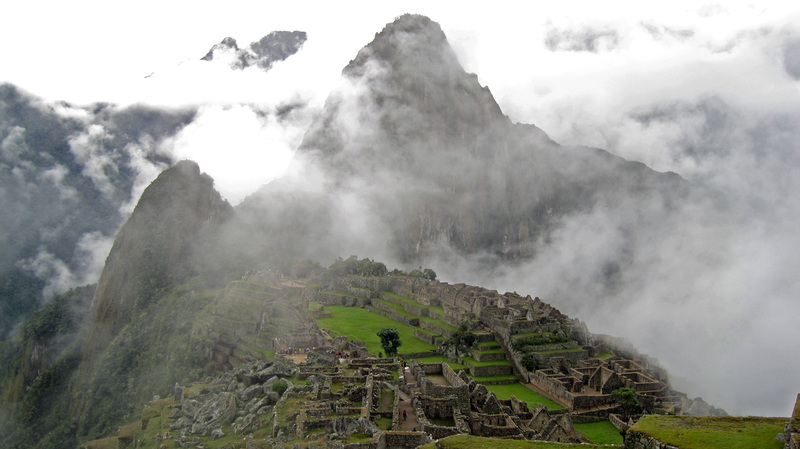 We boarded a flight from BA to Cusco, Peru and changed our worlds from developed to developing once again. Don’t put that toothbrush under the faucet! We had a fantastic time in modern and busy Buenos Aires, but were both looking forward to getting out of the ‘big smoke’ and having some more adventures and challenges in the mountains again. 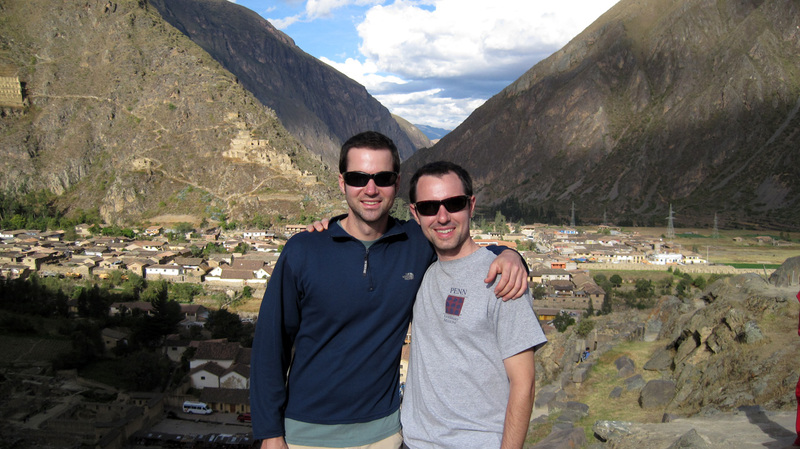 More importantly, my best bud Andrew and his wife Vicki agreed to come down and meet us in Cusco for their own Andean adventure. Also, this was a celebration of Vicki’s recent graduation from Vet school! It was great to see them again, and it continued the tradition of Andrew and me meeting in far off places for fun in the mountains. 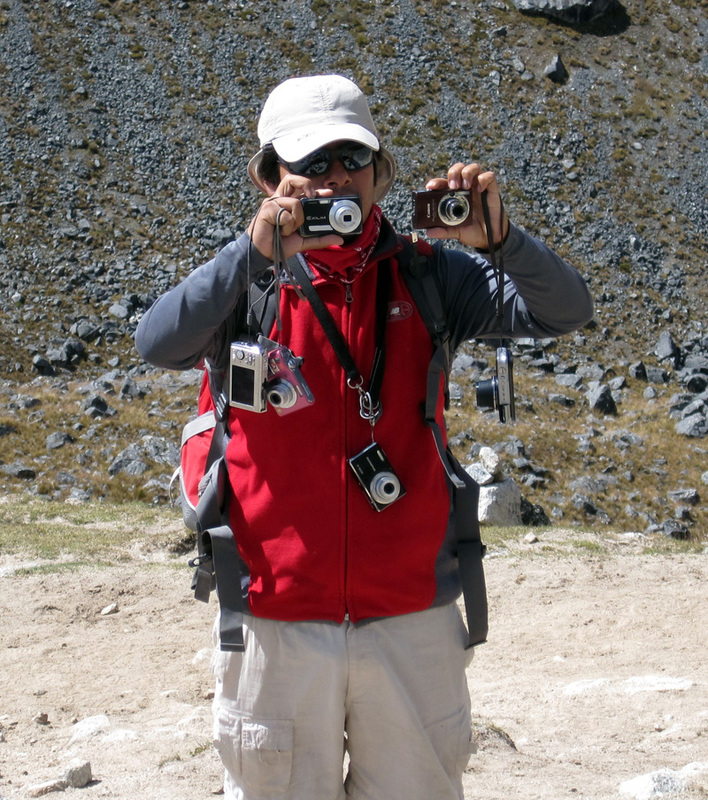 Before arriving in Cusco, we had worked with a Peruvian guide named Wilson aka the “Inka Prince” to set up the Salkantay trek to Machu Picchu and some tours around the Sacred Valley. Wilson also arranged our accommodation in a nice little hostel right on the main square, in Plaza de Armas. 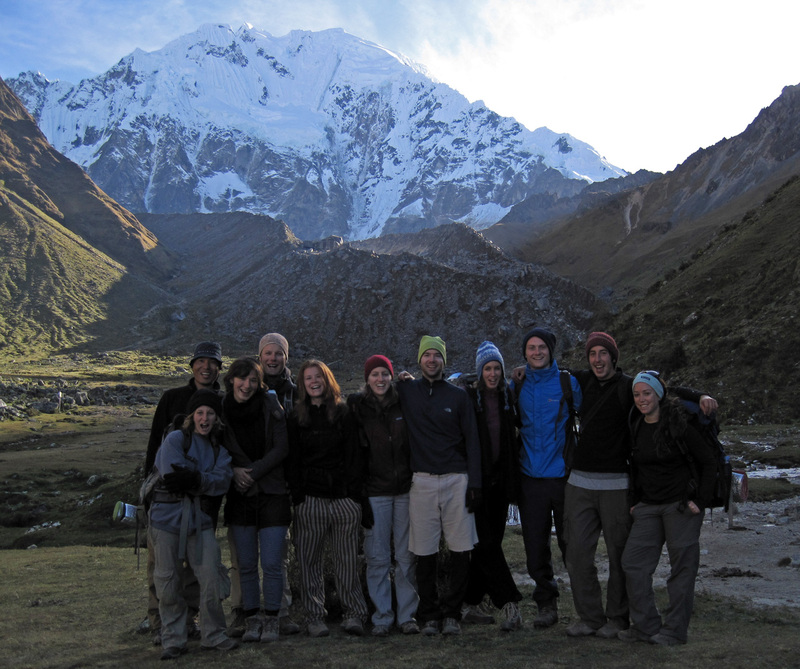 On our first full day we set off on a tour of the surrounding area, called the Sacred Valley. 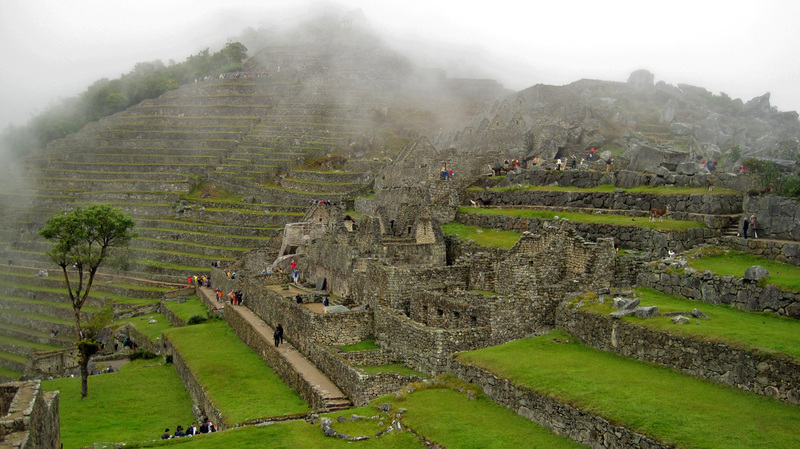 Cusco was the heart of the impressive Incan empire, and almost every town nearby has enormous terraces and remains of their civilization. 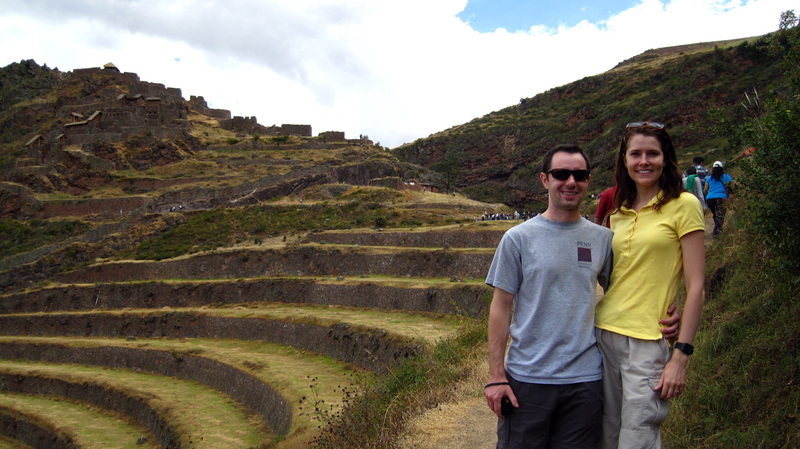 Andrew & Vicki on the Sacred Valley tour at the Pisaq site. 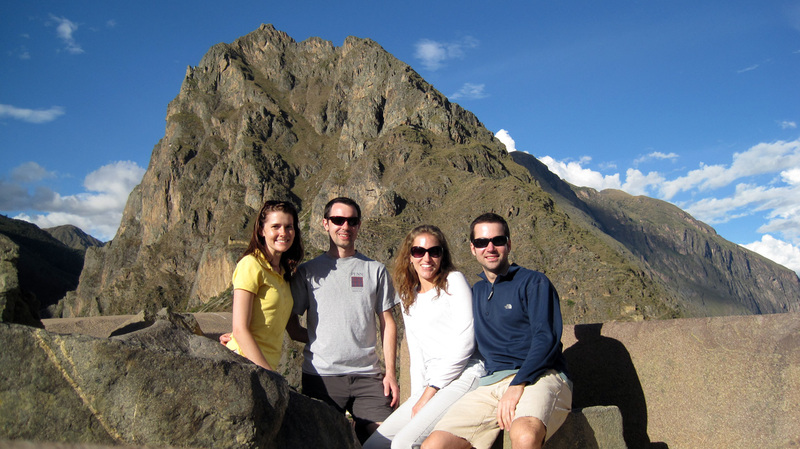 We had a beautiful day touring the Sacred Valley, here we are above the ruins of Ollantaytambo. 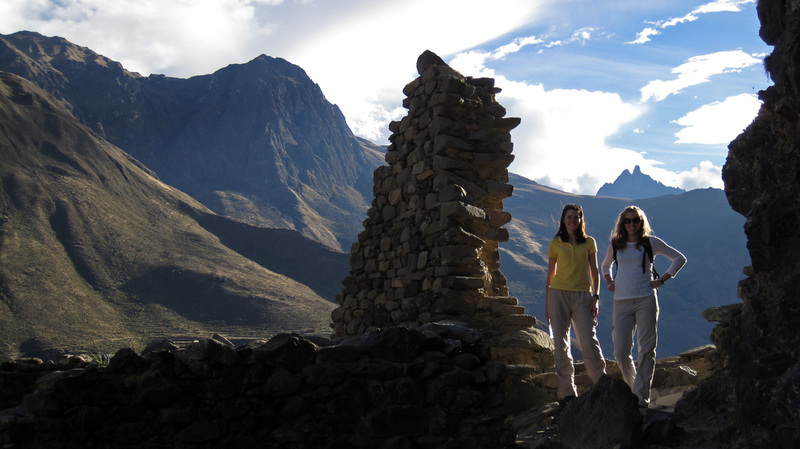 Vicki & Caroline hiking around Ollantaytambo. 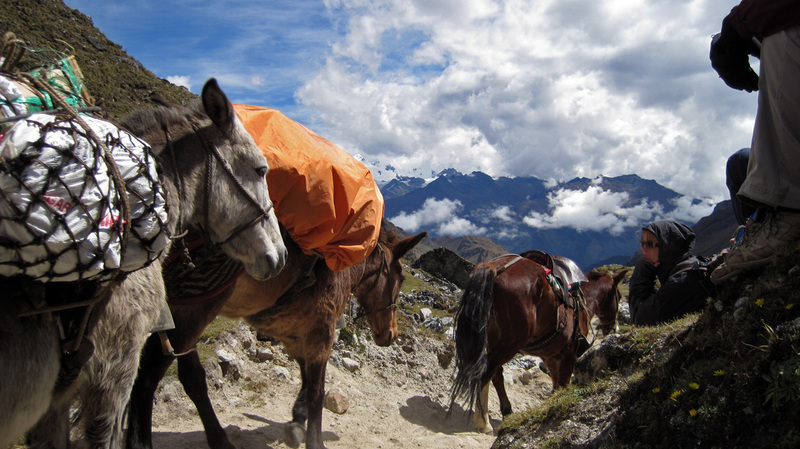 Originally we had all planned to do the challenging five day Salkantay trek to Machu Picchu, but a few weeks ago we found out that mules would be used to help carry some of the gear for that trek. This is pretty common on guided treks, because of the need for group cooking gear, food, tents, etc. Unfortunately, Vicki has a very strong allergy to horses, which mules are obviously closely related to. This could have been a disaster, however Wilson saved the day by organizing an alternative bike/trek to Machu Picchu for Andrew and Vicki to do that was horse/mule free. 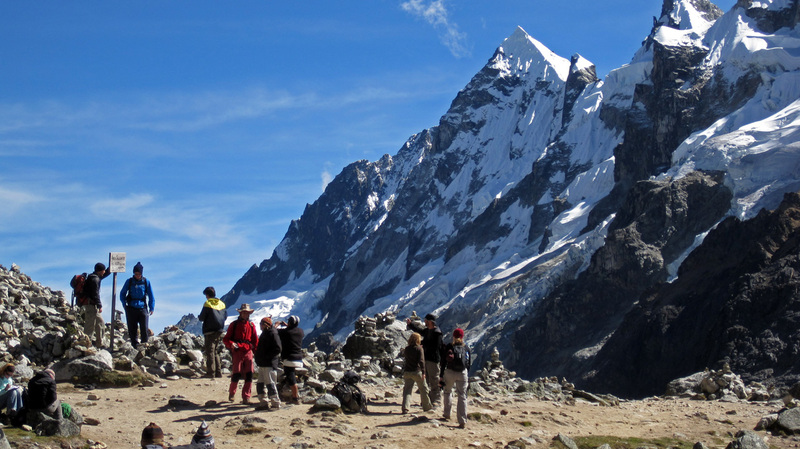 This alternative also allowed us to meet up in Aguas Calientes on our fourth day and share the trek up to Machu Picchu together the following morning. 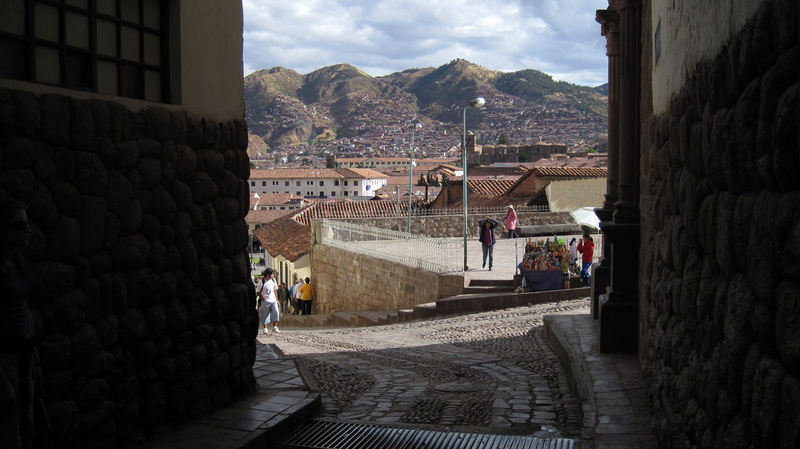 Our five day trek left the day after the Sacred Valley tour at 5am, but A & V didn’t have to leave until the following day, which gave them a chance to explore more of Cusco. It was logistically a little tricky, but everything worked out perfectly in the end. 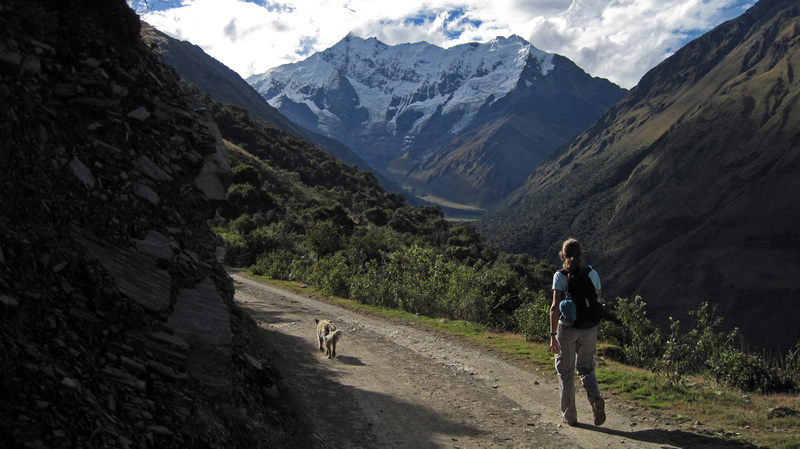 Day one on the Salkantay trek. Starting low in the valley, we ended the day at camp 1 high up in a cold mountain valley. Our Crew: (left to right) Yanel (Israel), Juang(Hong Kong), Catarina (Germany), Shaun (US), Jess (US), Caro, Pat, Natalie (France), Mike (UK), Paul (UK), and Mora (Israel). 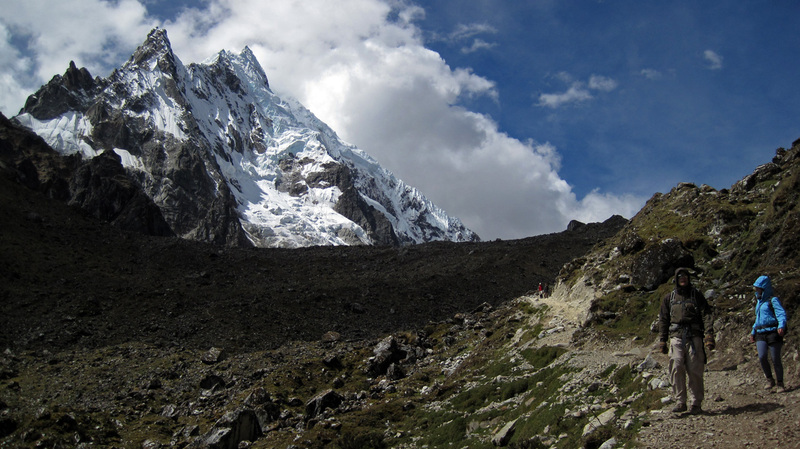 Heading up the Salkantay pass on day 2. 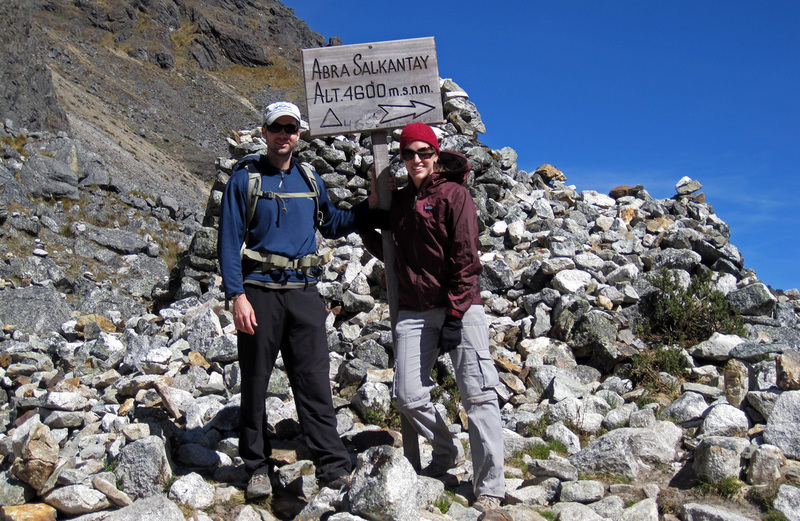 Making it to the top of beautiful Salkantay Pass at 15,000ft. We were completely beat at this point, but still had a long way to go to camp that night. It was a big day, up at 5am - got to camp at 5pm. An elevation change of 3000ft up and about 5000ft down. Wilson was a pro with the cameras for the group shots. These beasts carried our tents, food & gear, but sadly prevented Andrew & Vicki from joining us. They had a great time on their trek too which went a different route. We got very lucky with the weather. This is my favorite shot from the trail. We were always surrounded by steep unclimbed (mostly) peaks. The trek went from low to high and back to low again, going around Salkantay and the surrounding mountains before terminating at Aguas Calientes at the base of Machu Picchu. Our first two camps were in very primitive villages with just an outhouse and a garden hose bringing water down from the mountains. 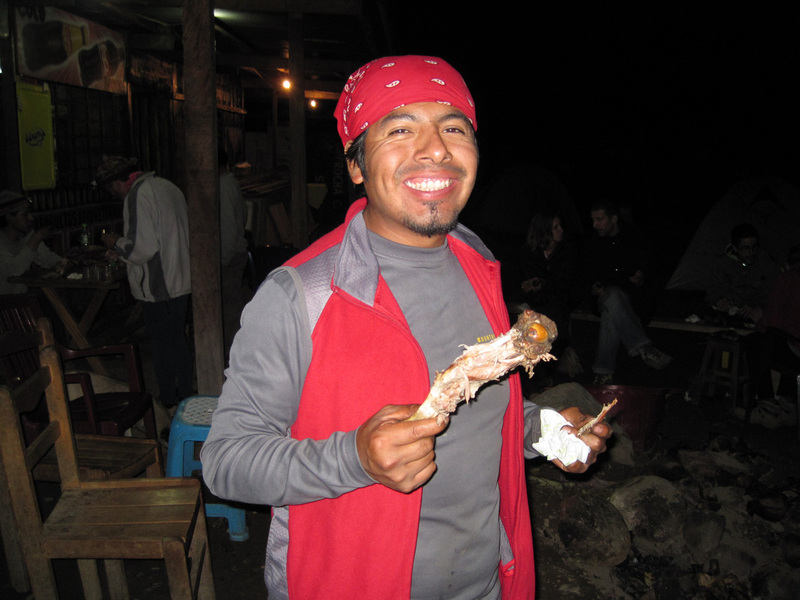 On our third night, we camped in a bigger village that actually had electricity, running water and pigs. 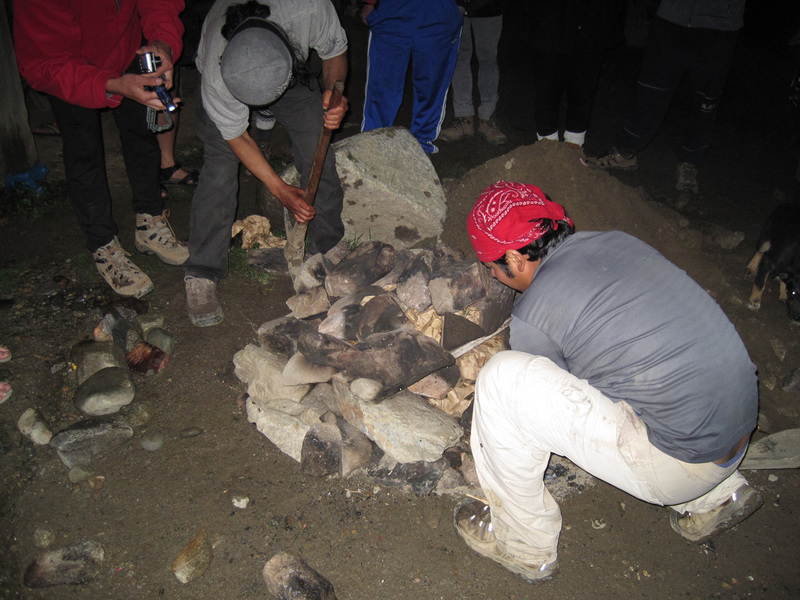 Wilson had been talking up a ‘pachamanca‘ which is a traditional Peruvian method of cooking pig (and other meat) in a hot stone oven buried in the ground. Everyone was super keen to give it a try, so we all set out to find a suitable hog to slaughter that night. Well, that was our first mistake… Apparently, when a Peruvian pig farmer sees as a group of wide-eyed, blood thirsty gringos show up, they see an opportunity for price gouging. After being quoted 5,000 soles ($1,757.78 USD) for one giant hog, we all knew we had to change our strategy. 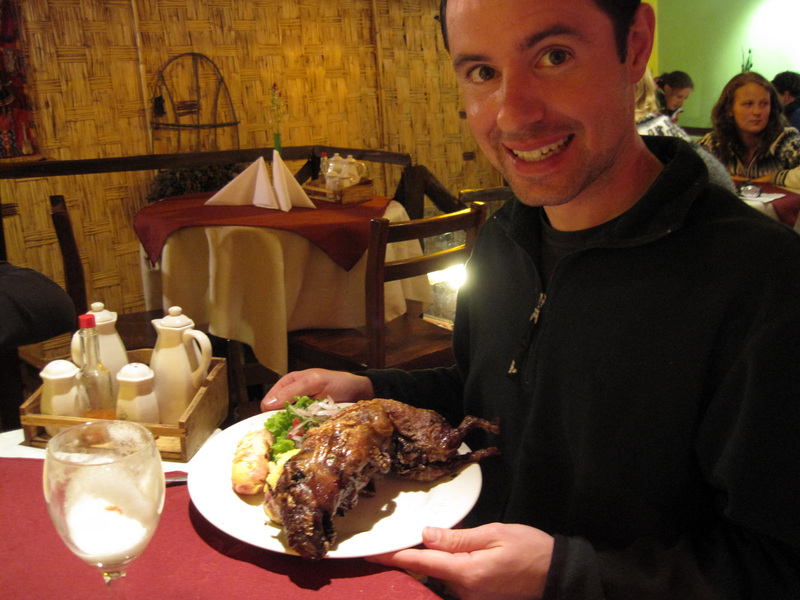 So, with far fewer gringos we sent Wilson on the pig hunt and he got us a medium sized piggy for 270 soles ($94.92 USD). Well done! We had agreed with the other group of about 1o at our camp to share the cost and meat, it turned out to be just enough for twenty people. Juang, from Hong Kong, got to do the honors of cutting the pig’s throat while Shaun, Paul and Mike held the squealing beast down. After that it took a while for the skinning and gutting to be completed, in the rain and dark, by Wilson and Eddy (the other groups guide). This was a fascinating process that we all got a chance to watch, intestines are so long! Definitely not for the faint of heart though, but super tasty. 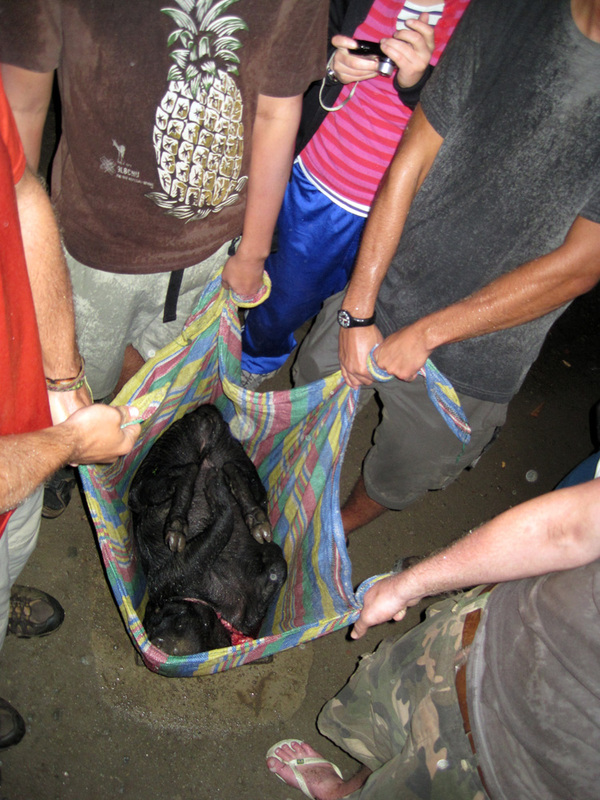 Pig shoppin' at the last village we camped in. And this little piggy got eaten by twenty gringos. 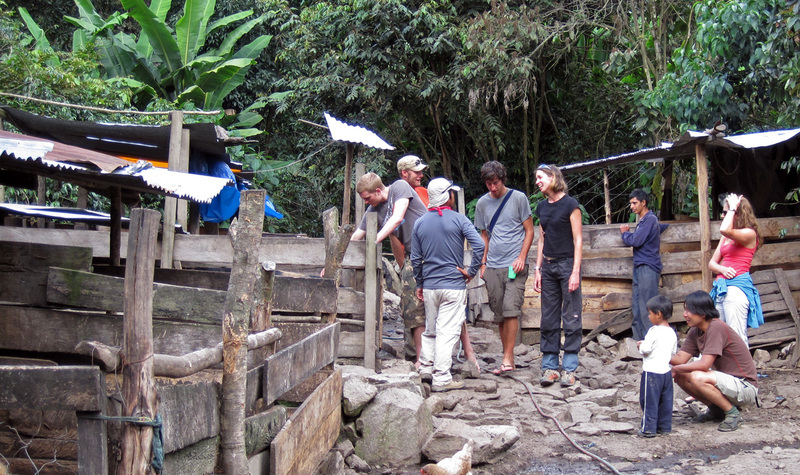 Building the 'Pachamanca'. It goes: layer of - hot rocks, pig, hot rocks, pig, hot rocks, potatoes, hot rocks, pig... Cover with Banana leaves, a plastic tarp, and dirt, and let cook for 1.5 hours. From running around the pen to in our bellies just 3 hours later. 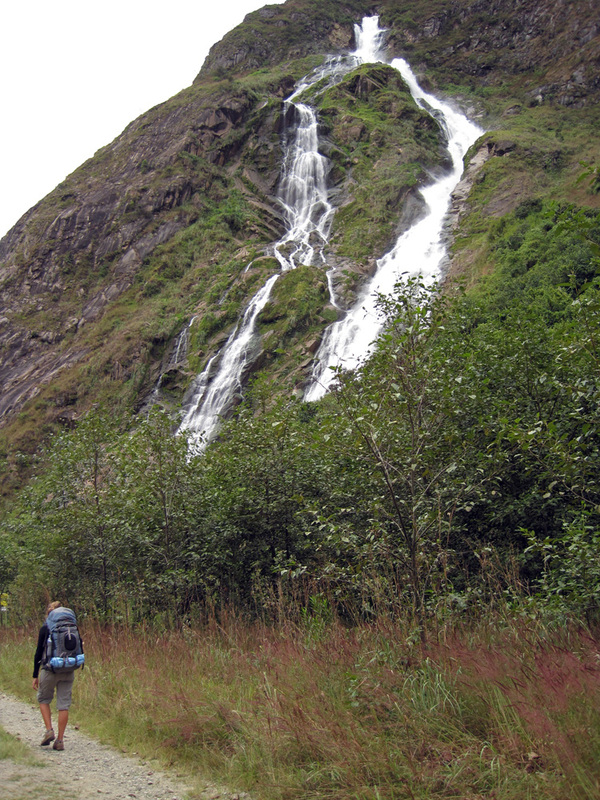 Our fourth and final day of hiking was spectacular. We followed a lush valley with a swift river for most of the day before climbing up and over the mountains to the next valley. At the top of this thick jungle pass we heard some scrambling and the guys in the lead swore they saw two small bear run across the trail! We were pretty skeptical that the guys actually saw bear, and Wilson (the guide and authority on the matter) was a few minutes behind. Just then, one of the bear cubs climbed a tree and hung out there, case closed! We had no idea there were bear in Peru, but indeed, the black Inca bear is common in the area. 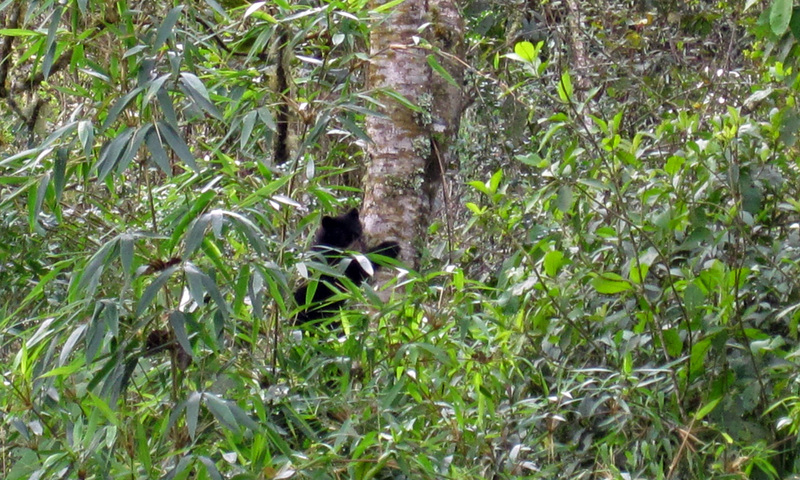 Two Inca Bear cubs crossed the trail on the last day, then one climbed a tree to check us out. Very glad big mama was not nearby. We didn't even know there were bear around! On our final decent to the last valley we caught a glimpse of Machu Picchu for the first time, nestled in the saddle of a ridge with tall cloud covered mountains all around. Truly, a breathtaking sight! My first thought, after hard hiking for days and days, was: “$#@%, it’s still so far away!” Though, it was relatively easy hiking down then up the train tracks to Aguas Calientes, the town at the base on the other side. Click on the picture below to see what I mean. 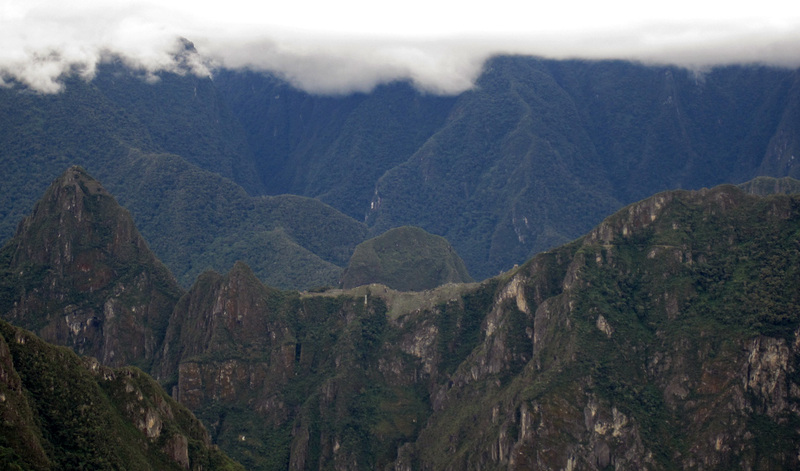 Our first view of Machu Picchu, right in the saddle of the mountain (middle). 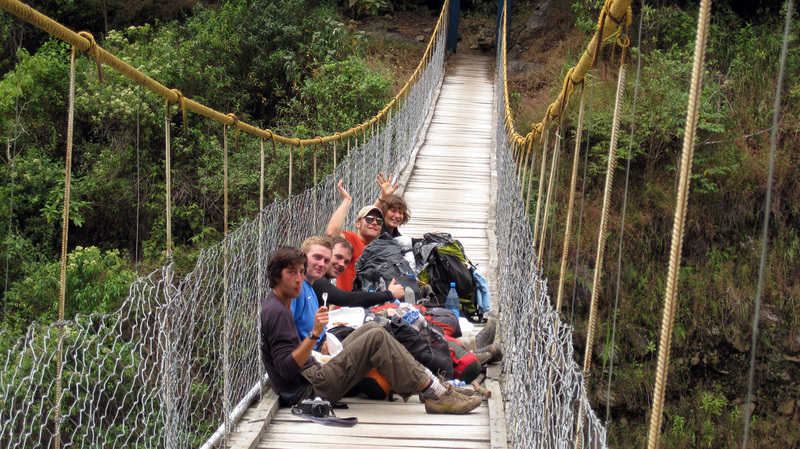 Last lunch break before arriving at Aguas Calientes/MC. Hiking below the outflow from HidroElectrica. 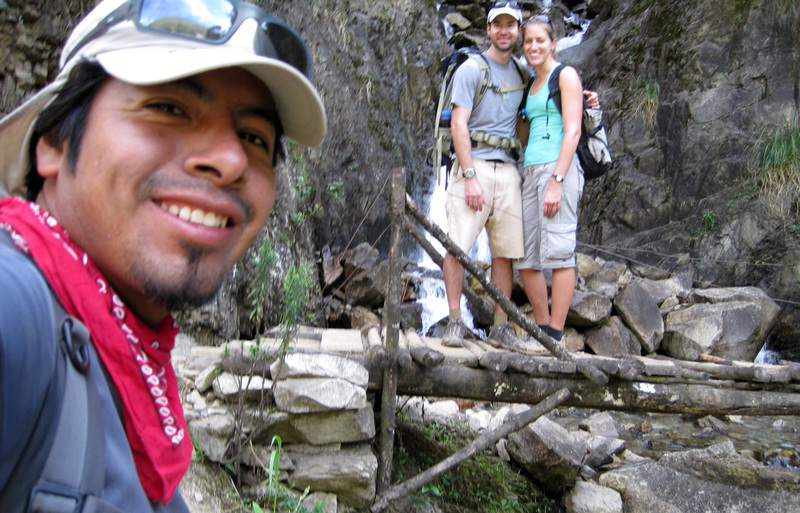 When we arrived in Aguas Calientes, we immediately met up with Andrew and Vicki at our hotel on the river. It was great to see them and impressive that our separate treks actually got us there within about an hour of each other. We all went out to dinner with the whole crew from our trek that night to celebrate. It wasn’t a late night, since everyone was planning to get up at 4am the next day to start the final climb up the stairs to Machu Picchu. Sadly, the weather didn’t cooperate with us and we woke up to a steady rain that morning. So, our hopes of watching the sunrise over the mountains and magically illuminate the lost city were dashed. We still hiked all the way in the rain and got there just in time to watch the first completely dry tourists arrive in the shuttle buses from town. Wimps! So we all explored the city with Wilson for a while as he showed us all the notable buildings and areas of this massive and impressive complex. I started to feel ill when we completed the stair climb, not sure what it was from. So after a few hours of touring around, I went back to the entrance to chill out, while the others went on to explore more of the city. The fog and rain actually added to the mystical feel of the place. I could have done without the 3:30am start though. 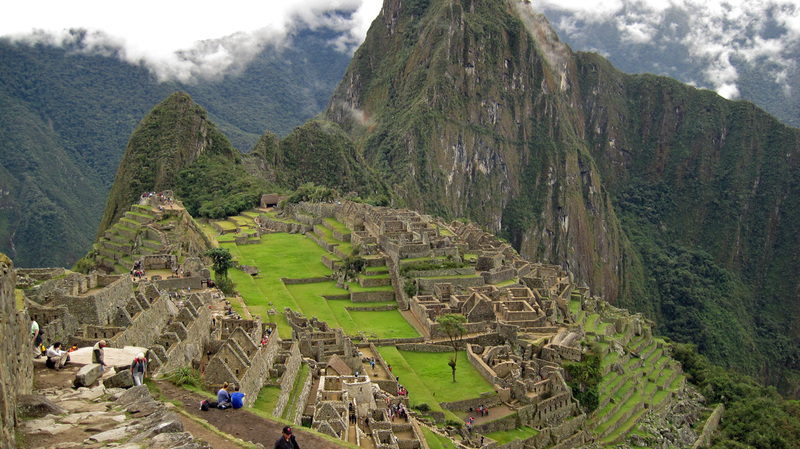 The famous Lost City was a huge landmark for us. It was everything I hoped it would be, massive and intricate, a true engineering wonder. 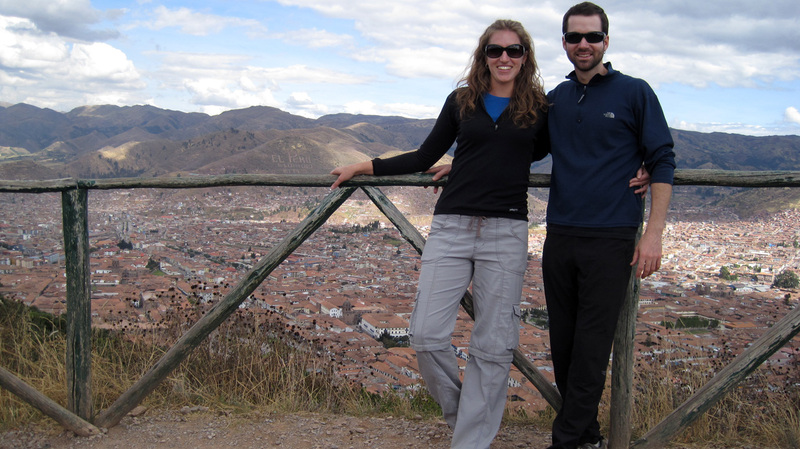 With just one full day left in Cusco before Andrew and Vicki departed, we all relaxed and recovered from our treks. 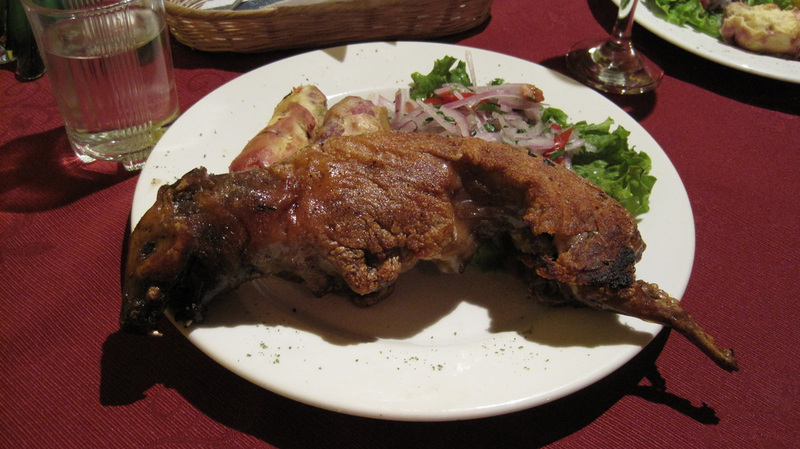 That night we went out for another Peruvian specialty, Cuy or as we know it: Guinea Pig. It was an interesting flavor, not sure I’ll get it again, but glad I tried it. The next morning A&V took off back to Lima and then home later that night. We said our goodbyes and were glad to have had great friends join us once again on this long journey. It really makes it so much more fun when we can share these good times with good friends. Thanks again guys! Cuy aka Guinea Pig. Turkey-ish flavor, very gamey. 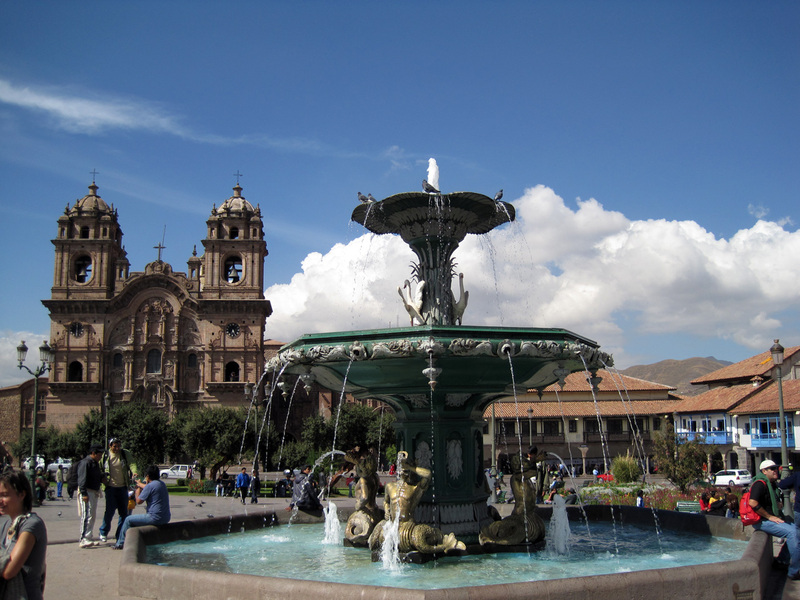 A really pretty day in Cusco, Peru. Plaza de Armas. Overlooking the city before our 20 hour bus ride to Lima. Final moments of freedom before hopping on the bus. 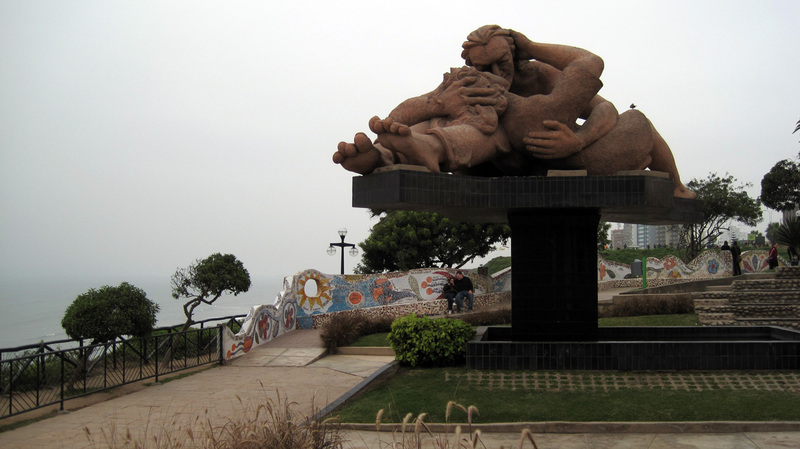 The kissing couple on the coast in Miraflores, Lima, Peru. Umm, a rating or warning of some sort might be a good idea on this post, something like ‘not suitable for the weak of stomach’ That second pig looked like a fried rat. I bet you’re dying for a taquito!